Aaron Harris, 26, is recovering from severe injuries sustained in the deadly Amtrak derailment in DuPont, Pierce County. But his potential financial claims against the company could limited by Amtrak’s liability cap. For four hours on Monday, Bob and Lisa Harris had no idea if their 26-year-old son, Aaron, was alive or dead. The couple, who live in Eliot, Maine, learned their only child was aboard the Amtrak train that derailed in DuPont, during its inaugural Seattle-to-Portland run, from Aaron’s boss. He sent a message to Bob Harris via Facebook, then started phoning hospitals in the hopes of finding Aaron. Aaron, who moved to Seattle five years ago, was eventually found at Harborview Medical Center. Aaron, who suffered a traumatic brain injury along with rib and vertebrae fractures, was sedated and on a ventilator his first two days in the intensive-care unit, with staples closing wounds on his left temple and the right side of his head. “He was able to open his eyes this morning and recognize we were there,” Lisa Harris said on Thursday, seated next to her husband in the downtown law office of attorney Robert Gellatly, who specializes in medical malpractice and personal-injury lawsuits. 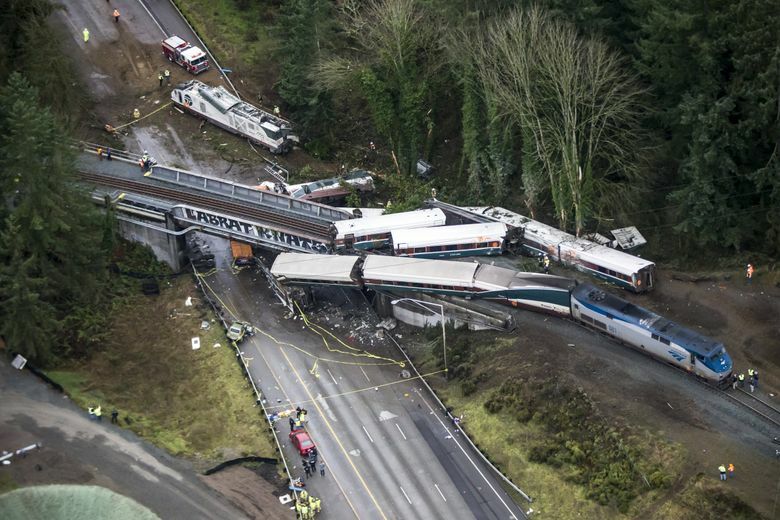 Gellatly anticipates Amtrak and other parties responsible for Monday’s deadly derailment that killed three people and sent dozens to area hospitals will soon face numerous lawsuits. 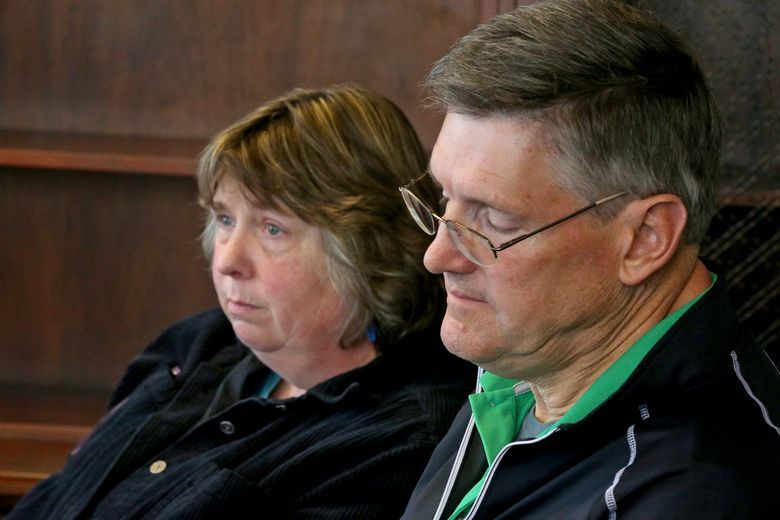 Bob and Lisa Harris are considering their own suit but are waiting for more facts to come out. So far the investigation into Monday’s derailment has determined the passenger train derailed on a curve while traveling 50 mph faster than the posted 30 mph speed limit, causing the locomotive and at least one of the train cars to topple off an overpass and crash onto southbound Interstate 5. The National Transportation Safety Board has said is too early to determine why the train was going so fast, but among the things investigated would be whether engineer distraction played a role. “This is inexcusable. It was preventable and it never should have happened. Amtrak has shown an utter disregard for public safety,” Gellatly said, ticking off other deadly train wrecks in Philadelphia, New York and California as recent examples. Bob Harris, who is semiretired and works at a golf course, and Lisa Harris, a high-school teacher, said it’s too early to know if their son has suffered any permanent cognitive impairment. They and their extended family are in it for the long haul, committed to seeing Aaron through what’s bound to be a painful recovery. How much money Aaron will be able to recoup for his pain and suffering remains in question. The Amtrak Reform and Accountability Act of 1997 set a $200 million liability cap, limiting awards to rail passengers injured or killed in a single crash. That number was last adjusted to about $295 million in 2015 and will be adjusted again in 2020, Gellatly said. Gellatly called the news “a good-faith step forward,” but said the lion’s share of victims’ claims will be for noneconomic damages — things like pain and suffering, disability and loss of enjoyment of life. Those subjective claims are typically contested and exceed economic damages for past and future medical expenses and lost income. An Amtrak spokesman in New York City could not be reached Thursday. Though Aaron Harris’ doctors hope to soon move him out of the ICU, his prognosis is unknown and he will need to be admitted to a rehabilitation facility after he’s discharged from Harborview, his parents said. “His sarcasm is intact. I’d think that’s higher-level thinking,” said Lisa Harris, who remains optimistic about her son’s recovery. As the couple were seeking information on their son Monday, Bob Harris said he called Amtrak and provided a physical description of Aaron. “We recognize the chaos of a mass-casualty scene. It takes time to get information but we had to find him ourselves,” Lisa Harris said, criticizing Amtrak’s failure to provide any help in learning her son’s fate. But she had nothing but gratitude for the city her son now calls home, where strangers have offered their support. Family members and Aaron’s far-flung network of friends, including team members of the former two-time All American college lacrosse player, have rallied around him and his parents, raising $27,000 in one day through a GoFundMe page, Lisa Harris said. 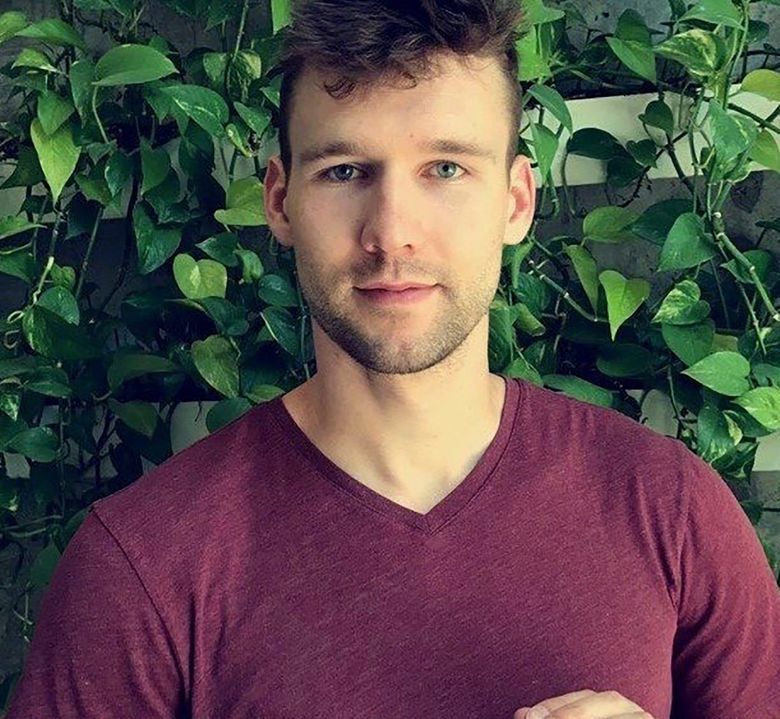 Aaron, who graduated with a business degree from Western New England University, is the general manager at Float Seattle, a wellness spa where clients float in tanks of saltwater, Lisa Harris said. McCormick, who owns the company, knew of Aaron’s plan to travel by train to Portland to pick up his car, she said. About a month ago, Aaron took his Honda Element to Portland, where it was fitted with a pop-up camper in preparation for a summertime road trip through the Southern U.S., his mother said. Another friend retrieved the vehicle Wednesday night and parked it outside the Wallingford house Aaron shares with three roommates, Lisa Harris said. Through news coverage, the couple has learned passenger trains across the country were supposed to be fitted with Positive Train Control systems in 2015, but the deadline to install the safety features — which would have automatically slowed the train — was pushed to the end of 2018. He and his wife are speaking out in hopes that by sharing Aaron’s story, they can somehow prevent future wrecks from impacting even more families. “The pain you go through emotionally, I don’t have the vocabulary to put it into words,” Bob Harris said.